Profile by Daniel Elting: The Black-throated Green Warbler is a small songbird that belongs to the large and diverse family of wood-warblers. They have a solid black bib, and a bright yellow face with a very dull green stripe through their eye and on their crown. The combination of these features makes them fairly distinct from other similar species and easy to identify in the field. The most similar species visually is the extremely rare Golden-cheeked Warbler which has a distinct black stripe through its eye and on its crown. Black-throated Green Warblers are foliage gleaners, meaning they hop and fly around in trees and shrubs and pick off small insects from the branches. You will most often see these birds in heavily forested areas where it’s easy for them to find prey. Black-throated Green Warblers are highly abundant breeders in the Northeast portion of the United States. They nest in trees typically about ten to twelve feet off the ground. Nests are a small open cup lined with twigs, feathers, spider silk, and moss. 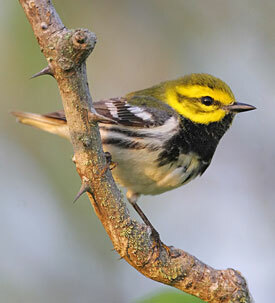 The Black-throated Green Warbler makes a distinct “zoo-zee, zoo-zoo-zee” song you will hear in the springtime. These birds sing constantly during the breeding season to attract mates, one individual was observed singing 466 times in one hour. Black-throated Green Warblers are currently passing through Texas on their way to South America. Come to our sanctuaries at High Island to see them, we often have them in our woods this time of year. Although they are not singing the fall, if you hear a light “chip” up in the trees take a look up, it may be a Black-throated Green Warbler!